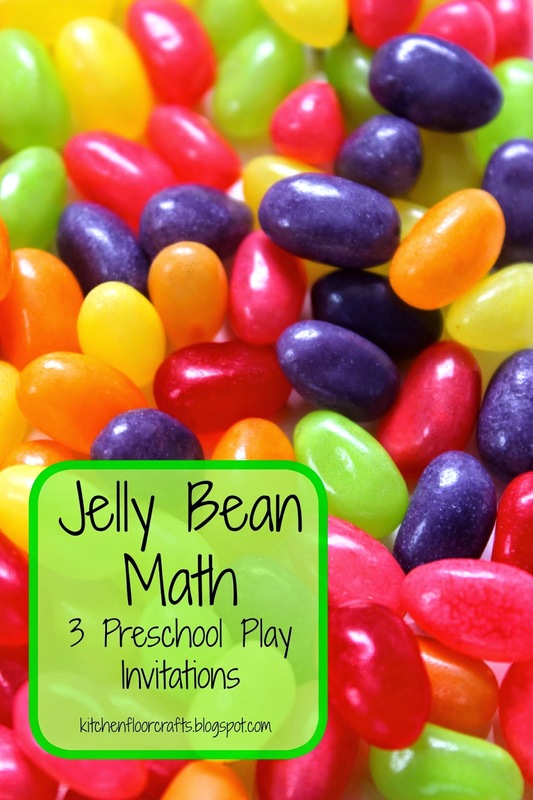 Big Brother was under the weather this week, and looking for a pick me up, which meant it was the perfect time to introduce some of the jelly bean math play invitations I'd had up my sleeve. In the past we've enjoyed using candy hearts at Valentine's Day to practice early math skills. 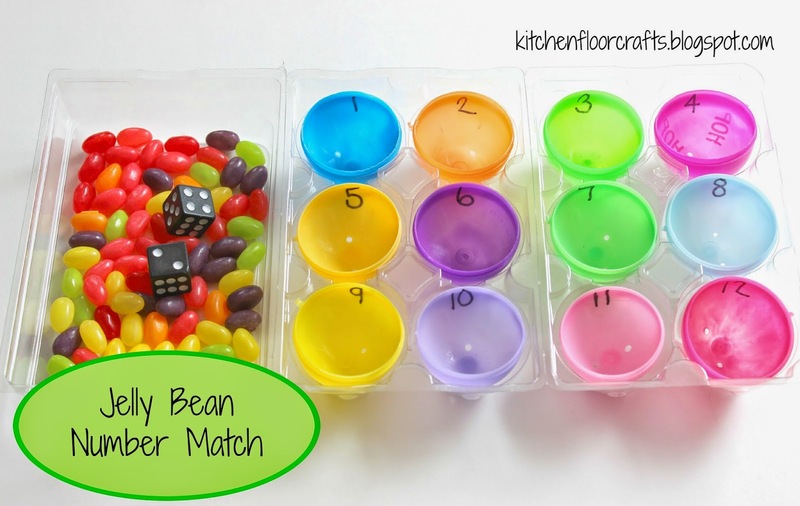 So with Easter coming up jelly beans made lots of sense for more candy math play invitations. 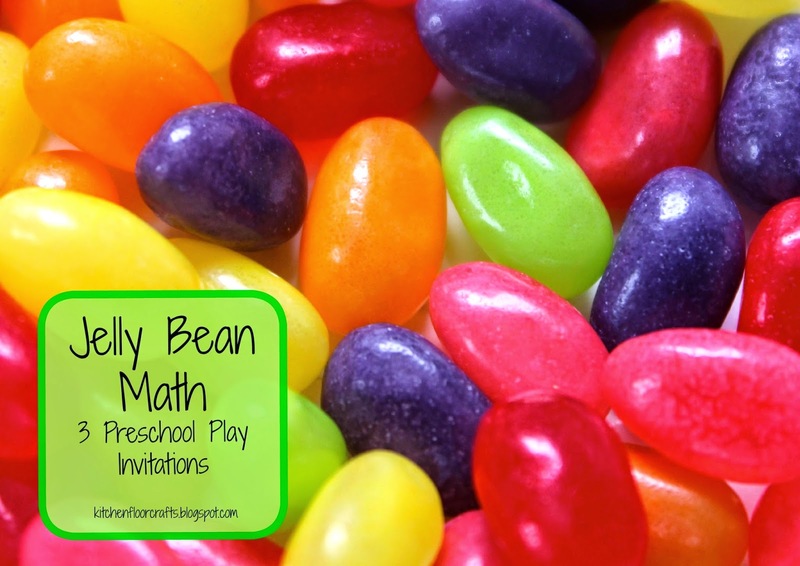 For our play invitations we used Teenee Beanee American Medley Jelly Beans , which comes in six colors. 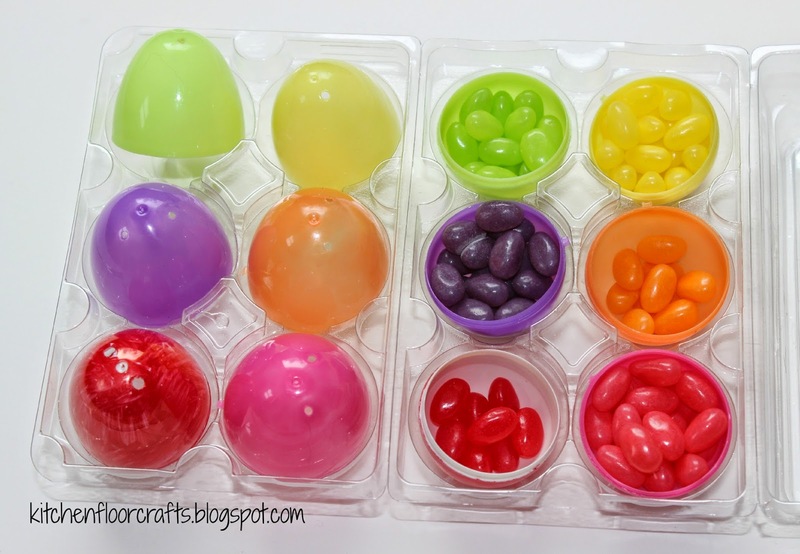 In addition to the jelly beans each play invitation also used plastic Easter eggs and a cleaned, plastic half-dozen egg carton. The egg carton was great because it folded out into three parts. I set up the egg carton with six plastic eggs, the bottoms on one side and the tops on the other. 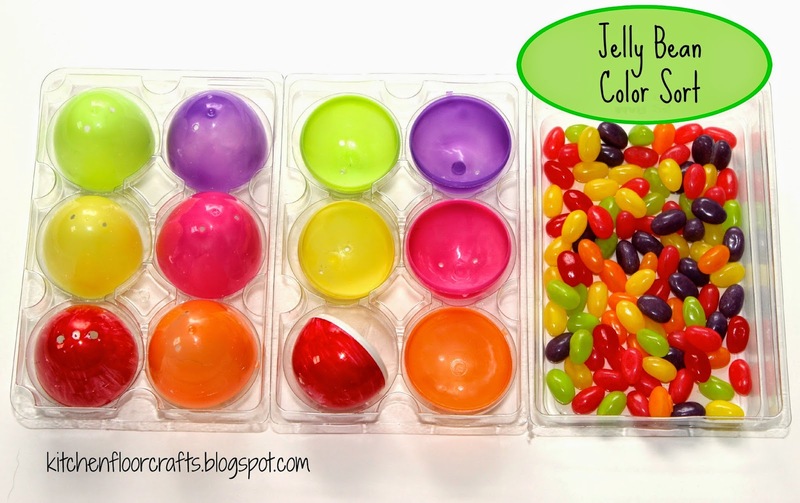 There was one plastic egg for each color of jelly bean (red, pink, yellow, orange, purple, and green.) We actually did not have a red Easter egg (has anyone else every noticed before they don't really make red eggs?) so I colored a white one red with permanent marker. I added the jelly beans to the lid of the carton. Big Brother was instantly excited about the jelly bean play invitation. 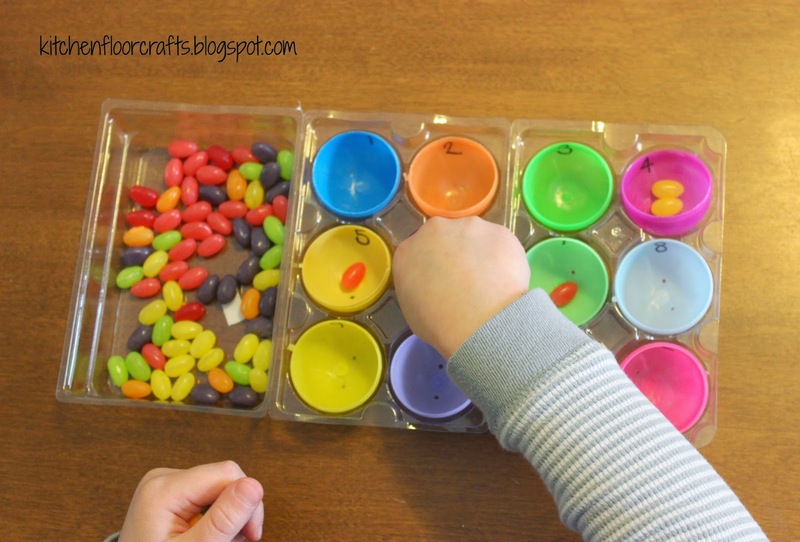 He quickly figured out that the purpose was to sort the jelly beans by color. He started adding the beans to the bottoms of the eggs. When he finished sorting one color he would put the top on the egg. It didn't take very long to sort out all the colors. With the colors all sorted, we were ready for our next play invitation. For this play invitation I created a graph. 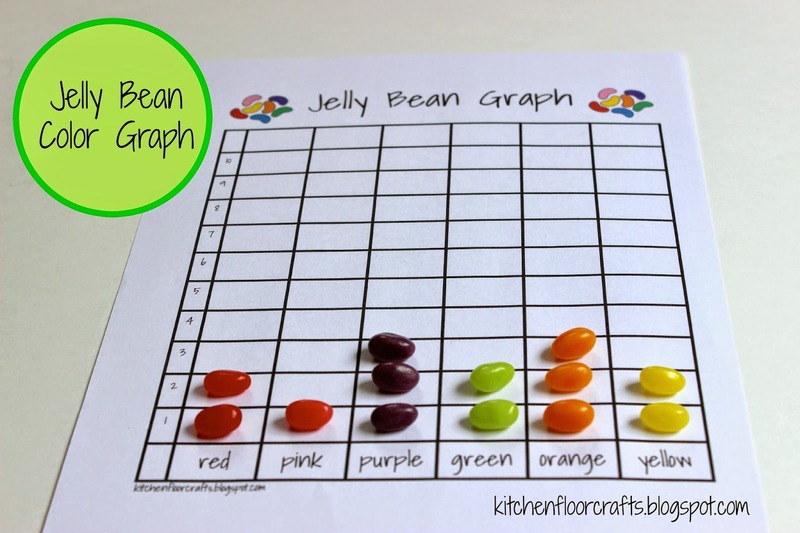 You can get a free copy of the printable jelly bean graph here. 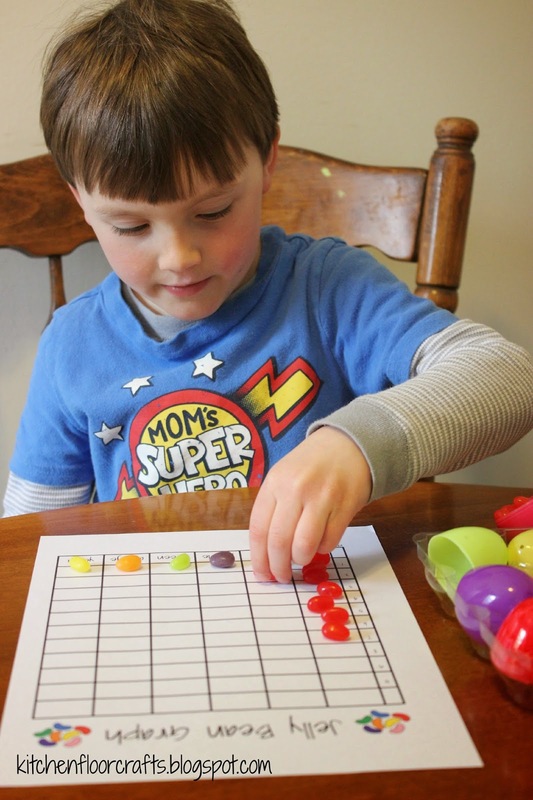 With a little help Big Brother read the different color words and started placing his jelly beans on the graph. We had plenty of jelly beans. Only the red and orange did not go to the top. He was actively counting those as he put them on though, as he could tell they had less beans. This would be a really fun invitation to do with a group of kids too. 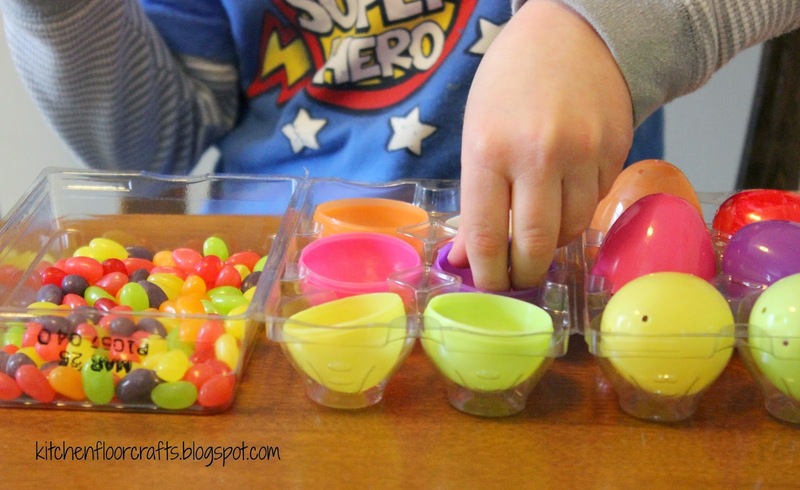 Each child could be given one egg full of jelly beans and then need to sort out the beans in their own egg. For our last play invitation we mixed all the jelly beans together again. This time I filled the carton with 12 plastic egg bottoms. On each egg I wrote one number, from 1 to 12, with permanent marker. We added dice to this play invitation as well. In this play activity Big Brother rolled the dice and figured out what the total was. He practiced saying the number equation (math fact) out loud as he played. So if he rolled a 3 and a 2 he would say, "3 and 2 is 5." He then would put one jelly bean (color did not matter) into the egg bottom that matched that total. 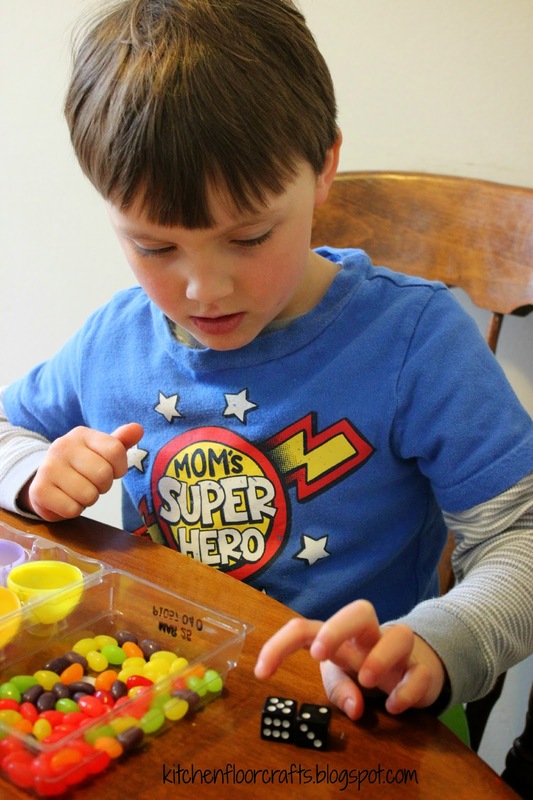 Of course there were several moments to "snack" on the jelly beans while he played (I'll admit it, from the grown-ups too) so the supply dwindled a little by the end. But Big Brother really enjoyed all three activities and was especially enjoying the slightly more challenging third activity. I'm sure after the Easter Bunny comes we'll have some more jelly beans to play with! What a great use of Jelly beans! Love this idea!